Stir together using a whisk or electric mixer on low speed. Do not beat. Set aside. Shape into a 5-inch disc and place between 2 sheets of floured wax paper. Roll into a 12-inch circle. Transfer to an ungreased deep dish pie pan. Trim edges and use trimmings to patch where needed. Briefly re-stir the filling and pour into the pan. Cover the rim of the crust with a pie shield or foil and bake for one hour. The pie is set when a knife inserted in the center comes out clean. Cool at room temperature (it takes 2 1/2 hours to cool). After that, keep it refrigerated. Note: All cinnamons are not the same. Ceylon cinnamon (most common) is milder than my favorite, Saigon cinnamon, which makes a spectacular pumpkin pie. If using Saigon cinnamon, reduce amount to ONE teaspoon. 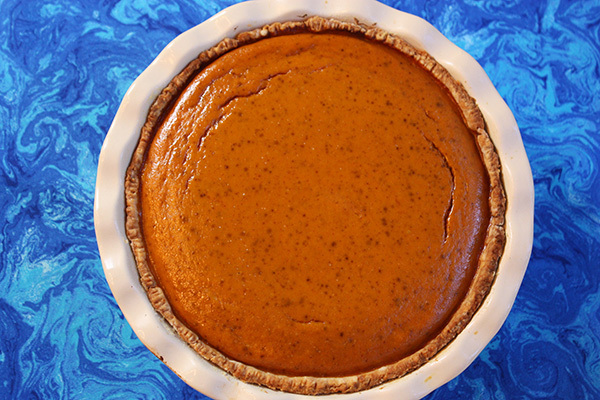 82 Comments on "Healthier Easier Pumpkin Pie"
Be sure to aerate your flour before measuring and you will not have to add more liquid. I never use store bought pumpkin. hi. I bought fat free evaporated milk instead of the 2% evaporated milk. Would this be a problem? I have only made this recipe the way it’s posted so if you need a guaranteed result it’s best to follow it exactly. Good luck! I have pumpkin pie spice. Would I use once teaspoon of that in place of the other spices? I’m not sure but I have pumpkin spice too. If you know, let me know! Why are the amounts different from your video? Great recipe… I used a pre baked pie crust… and cooked the filling till it started to thick.. stirring constantly… Perfect. . I have made pumpkin pie with almond milk or even coconut milk eliminating the evaporated milk altogether. The almond milk gives the pumpkin purée a nice taste, these two choices also make for a dairy free filling for those that have dairy sensitivity. Thanks Jenny for all the go to recipes! They are always tasty and tested by yourself which makes me want to make the! Hi, made several dishes with your recipes, they all came out great! I am baking pumpkin pie now, it passed 1hour and center is still watery, so I extended 20 min.more. Outer edges are cooked but middle is still runny. I am going to leave it little longer. Still watery in the center, should I take it out? I don’t want to get it burned. Thank you. I just made my pie yesterday and it always turns out. The middle will jiggle a little when it’s done but a knife needs to come out clean when you test it. If you did not change the recipe and used a standard deep dish pie pan, it should be done in in hour or may be with an added 5-10 minutes. Hi Jenny, thank you for responding. I was hoping to get thicken as it sat on the table but the middle is still watery. Can I put it back in the oven and cover the outer with foil where it’s cooked? I don’t know why mine is like that. I followed exact. If it’s not usable the way it is, you have nothing to lose by putting it back in the oven with the crust protected. When you have time after Thanksgiving, please list every ingredient, including brand, and the type of pan you used and maybe I can help figure this out. I’m sorry you’re having this problem. Hi Jenny, the pie came out great despite being little watery in the center. It was all gone within a day. For the fillings, I used Trader Joe’s organic pumpkin 15oz, and organic evaporated milk 12oz. I skipped cloves and followed exactly as rest of the recipe. Used 9 in. round ceramic oven wear. All I can think of is if you used a 9-inch round baking pan (with straight sides) and not a pie pan, which has a sloped edge, that may be why the filling didn’t cook. Also, you used 3 ounces more milk and if it was full fat and not 2%, it might have caused it to be too wet. I can’t think of anything else, but I’m glad you liked it either way. Hi Jenny, would this crust recipe work for a quiche? Happy New Year Jenny,I just finished baking this delicious pie recipe for a gathering that we are going to tomorrow.It has always been a success and I wanted to bring something to the party that wouldn’t disappoint.Thanks for all your great recipes.Making the cabbage rolls next!!! The little dog in the video is really funny! love all of your recipes. going to try the pumpkin pie. one question – after coming out of the oven, cool on counter or in refrigerator. Anything you bake should always cool on the the counter, preferably on a cooling rack. Refrigerate only after it has cooled to room temperature. Hi, I love the Pumpkin pie.I tried it.It is amazing. That was an great recipe. Hi, I really loved the filling! It is amazing! I will always love this recipe!!!!!!!!!!! Hey Jenny! I was wondering if I could use sweetened condensed milk instead of evaporated milk. No. It’s too sweet and too thick. I suggest looking for a different recipe if you want to use sweetened condensed milk. Hi Jenny, I do not have a deep dish pie plate. Can I split the pie filling into 2-8″ pies? And if so, do I reduce cooking times? I’m not sure… you may have to research this. 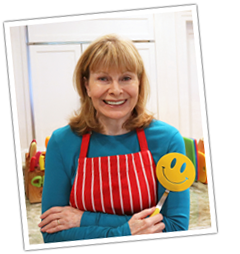 Hi Jenny, I am in love with your recipes especially the videos! Depending on what I’m making I keep my iPad right on the kitchen counter where I’m baking and can bake along with you while the video is playing! I’ll have you know that I’ve always been an avid baker but have stayer far away from anything with yeast UNTIL NOW! Because of your recipes and videos I find it so thrilling to make so many of your recipes with yeast! I’m so proud of myself… so thank you😘 I do have a question though… Can I use the oil piecrust in this recipe to make a berry pie? I’m using frozen berries but I’m not going to cook the crust first. I look forward to your answer. Thanks and continue the videos! I use the same crust for my apple pie and lemon meringue pie so it works for me either baked with fruit or pre-baked. I’ve never made pie crust without butter but I was surprised to see that it looked and tasted absolutely perfect. Great recipe! Wow Jenny thanks again for an awesome recipe. I know it’s April but I’ve made this for dinner tonight. Because my sone and I are lactose intolerant, I made my own evaporated milk by boiling 2 1/4 cups of Lactaid 1% milk to 1 cup so that we can enjoy this too. A little time to boil it down but all the evaporated milk on the market has milk in it? Thanks again! Jenny, I was never one to spend too much time in the kitchen as I dislike cooking but enjoying baking when I have the time and am not rushed. After discovering your site a couple of months ago, I find that I am in the kitchen more now. I like your recipes as they are not too time consuming, easy to follow instructions and the fact that you make recipes that are delicious without all the not so good for you ingredients like butter. I need more practice on the pie crust and was wondering how to store pumpkin pie in the fridge so that there is not condensation/moisture on the saran wrap. Do you know how to prevent this from forming? Love your videos – please keep them coming!! God Bless! Pumpkin pie should be completely cooled before covering and then I would not use plastic wrap because most baked goods need to breathe a little. Covering foods tightly with plastic often generates too much moisture. Try covering with foil or I use a pie container with a top but it’s not air tight. But even in the best case, there may still be a little moisture on the top of the pie and if so, I just blot it with a tissue. Hi Jenny, can I use low fat milk instead of the evaporated milk? Thanks. No. The evaporated milk helps to thicken the filling. Can I use raw pumpkin instead of canned pumpkin? Also, can I use something besides evaporated milk? Something a 11 year old could get her hands on? Would the taste be affected if I didn’t use some of the spices? Sorry for so many questions. Thanks beforehand! You can use fresh pumpkin but it has to be cooked and mashed first. Evaporated milk helps to thicken the filling. The spices are the only source of flavor in pumpkin pie. With this many changes, you’d be better off finding a different recipe that’s closer to your needs because this won’t be my recipe and I don’t want you to be disappointed in my recipes. If I used everything the recipe asked for except I would have fresh pumpkin, would that be okay? Yes, that would be good. Just a side note, canned pumpkin has more vitamin A than fresh… who knew? What? How? I still think fresh pumpkins are healthier. This is a great pie, I made two changes. I did not have a 9 inch deep dish, so I used a standard 10 inch and the fill was perfect. I also wanted to make it diary-free so I substituted sweetened almond milk for the condensed milk. The results were great. Thank you for the post and video. This recipe does not call for sweetened condensed milk. It lists evaporated milk, which is not sweetened. If you use sweetened milk, it will be much sweeter, so I suggest reducing the amount of sugar. Oh, I hope no one confuses evaporated milk for sweetened condensed milk, which is very sweet and very thick. Evaporated milk is more liquid and not sweet. Thanks for bringing that up. I have never done this but I looked at some crustless pumpkin pie recipes in ramekins and they bake at 350 degrees for 35 to 45 minutes. Hi Jenny the pie plate needs to be 2 inch deep but what about the size of the pie itself 7? 9 inch? I use a standard size pie pan, which measures about 7 inches across the bottom and 9 inches across the top (theat’s inside rim of the top, not the outside which usually extends). Thank you for the information I was looking every store for 10″ pie pan ..No for 2 inch deep pie pan…..
May I know cloves isn”t garlic powder? If without this will it make any different for the pie? How many inches deep is your pie pan? Mine is just 1+ inch 3 cm deep only, so what can I do? I love the puppy, its make me laugh a lot, sooooo cute!!! I see the confusion. Garlic is measured in “cloves” but no, this is not garlic in any form. A clove is a spice similar to nutmeg and it is important to this recipe. My pie pan is almost 2 inches deep so I don’t think you can make this recipe unless you can figure out how to reduce the filling ingredients in half, which may not be easy. Thanks for your quick respond, I”ll try to figure it out, may be buy a deeper pie pan, here got sell clove but is not in powder, will find someway else selling clove powder. Some of our stores carry “pumpkin pie spice” which contains all the spices in one. Hi jenny, if using pumpkin pie spice how much of this would i use? 2 tsp? 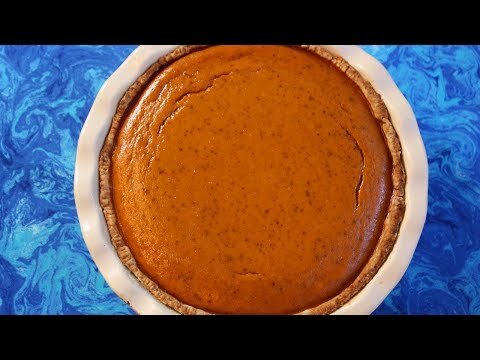 Hi Jenny: I just made this pumpkin pie but the crust was no soft to handle like you show in the video also was no enough to cover the border of the dish….when I used the roller the crust was no easy to get it thin….what is wrong? Thanks for the tips…I will do it again…next time I will sift the flour. Pre-sifting could make it measure less than you need. I would stick with just stirring it up really well. I’ve made some of your recipes, and recommending them to my friends .. I’m about to make this recipe too .. but if I didn’t find the evaporated milk, can I use condensed milk instead, and omit the sugar? If you can’t find evaporated milk a better choice would be to replace it with half-and-half or a light cream. I use light cream instead of evaporated milk. We don’t like the taste of evaporated milk. Also omit the cloves. It’s so delicious. Gone quickly. Jenny your pumpkin pie was awesome! I loved the crust, it was so much easier than using butter!! I cook with you all the time, since my Mom passed 2 years ago, you took her place as my cooking advisor! Can I use skim milk instead of 1% for the dough. I have never used skim milk in this recipe but I suspect the crust might not be as tender. Hi Jenny; did you get the pie ring/shield at sur la table as well? I can’t seem to find one anywhere. I don’t remember where I got it. Where have you looked? Ethan, I got mine at Bed Bath & Beyond. I was there today, but only saw the 10″ variety. You might be able to order a 9″ one off their website. I was wondering about the pie rings too,I’ve been using aluminum foil,which is a pain,I think I saw an adjustable one on Amazon.com,has anybody seen this and used it ? Hello jenny! Thanks for sharing this recipe. I was wondering… What are your thoughts on using gas or electric ovens. Which do you prefer? I am planning to buy one and I was hoping to get your opinion on this. Btw which one are you using in baking? Thanks in advance! I have a dual fuel range. That’s the kind that has a gas top for cooking and an electric oven for baking. I think it’s the best of both worlds. Where did you purchase your pie pan? I love the little dog, too cute!! I got the pie pan at Sur La Table. Can i sub evaporated milk with yogurt or something? I really don’t know of any substitution, sorry. I made this pie last night as a pre-test for Thanksgiving and holy pumpkin pie did this turn out great. HANDS DOWN the best pie I have ever made, crust was perfect, flavor was great! This is a must try people! Thanks Chuck! I plan to make this for thanksgiving as well. I’ve never made a pie because I was intimidated by the crust, but this one looks super easy. I thought of doing a test-run, but, after your comment, I don’t feel I need to.